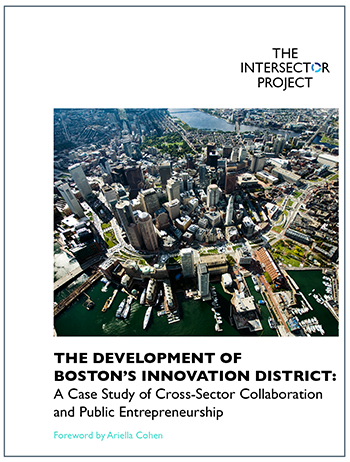 The Development of Boston’s Innovation District: A Case Study of Cross-Sector Collaboration and Public Entrepreneurship is a new report from The Intersector Project that looks at the role of collaboration across business, government, and non-profit sectors in the development of one of the country’s most talked-about innovation districts. Emerging in urban centers across the country, city-level innovation districts are geographically distinct areas intended to attract cutting-edge companies, research institutions, startups, accelerators, and other related entities, creating a dense community of innovators and entrepreneurs. Understanding how city-level innovation districts can harness the strengths of each sector is particularly important in an era of urbanization, limited public resources, and increased public expectations of public sector innovation. Understanding how city-level innovation districts can harness the strengths of each sector is particularly important in an era of urbanization, limited public resources, and increased public expectations of public sector innovation. Drawing from interviews with District stakeholders including entrepreneurs, non-profit leaders, and City officials from the Mayor’s Office and the Boston Redevelopment Authority, the report focuses on the role of the public sector in driving the District forward. It examines the context that gave rise to the District, the strategies that guided the District’s development, key milestones reached through leveraging partnerships with the business and non-profit sectors, and more. We hope this report illuminates how other public sector officials can work with business and non-profit sector partners to create innovative economic development strategies.